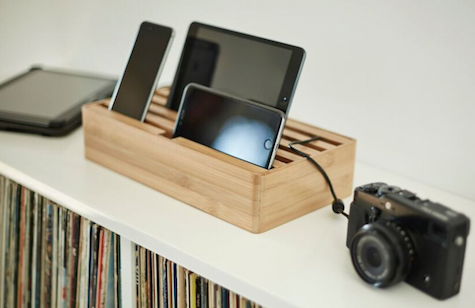 European design and styling combine forces in this array of beautiful, world-best, natural wood charging stations for iOS and other portable gear, including the Apple Watch. 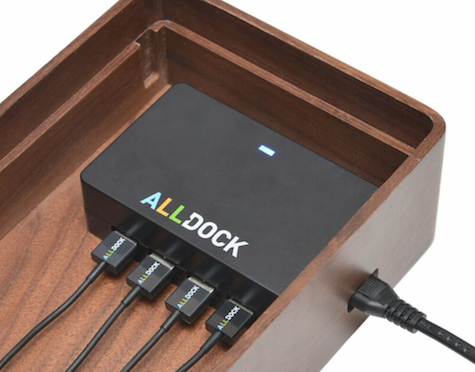 Different sizes of All-Docks are available. Each charging port has a full 2400mA smart power supply. Cables are out of sight within the base section while your devices are displayed in the order you choose for use while charging, if desired. Study the features on the company site here. New accessories are being introduced in 2016, including wireless charging components and one-hand docking for Lightning devices. All-Dock is a universal charger, because it charges everything and works great everywhere. When visitors see it sitting proudly on my shelf, they say What’s that, Nemo? Whatever it is, I want one. Sure looks gorgeous. 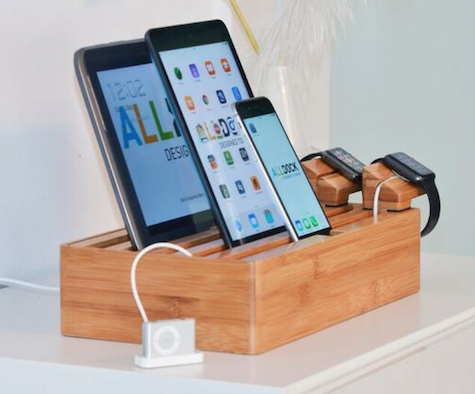 All-Dock is versatile, with its side-mounted Apple Watch cradle, different wood finish options, and several available sizes. White All-Docks are the most affordable, then the attractive bamboo, with walnut units being the most expensive and the most impressive. A few cables are included; I recommend ordering a couple of extra Lightning cables directly from the company. See our previous gift guide items here and here and here and here and here.